Ancestral Connections 2014 is an International Genealogy summer school developed by Lorna Moloney at ACE – University College Cork, it offers a programme of outstanding quality for those interested in tracing their Irish roots. All aspects of subjects are covered by a series of presentations and ‘hands on’ workshops given by a selection of Ireland’s leading genealogical lecturers and experts.Eneclann’s very own directors Fiona Fitzsimons & Brian Donovan will also be giving talks at the Summer school. 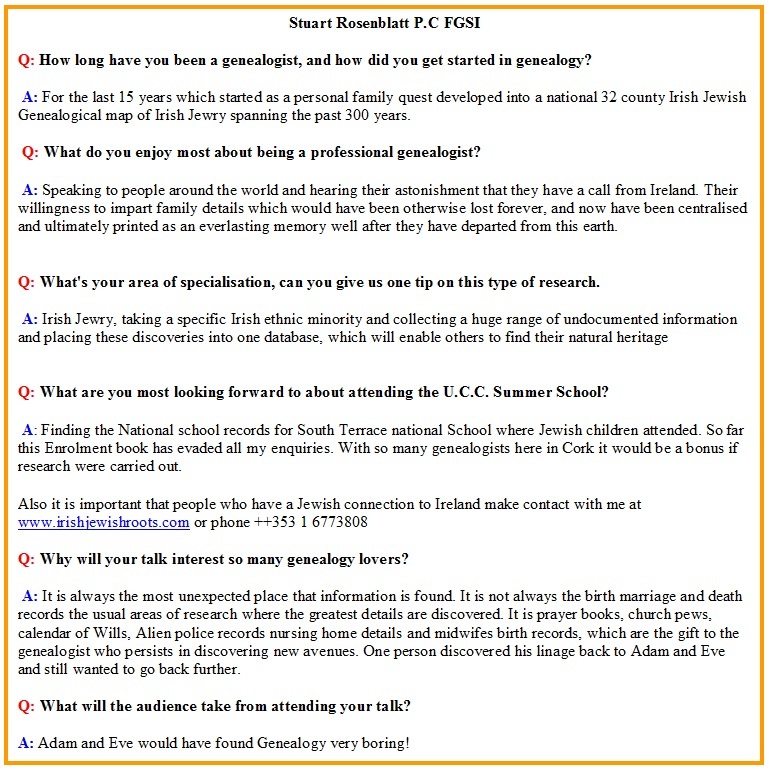 This week we caught up with Stuart Rosenblatt of theIrish Jewish Genealogical societywho will be giving a talk atThe UCC Genealogy School . Thursday the 3rd of July at 2pm-2.45pm. In addition toEneclann, experts from Limerick Genealogy, Roots Ireland, The Church of Jesus Christ of Latter Day Saints and the Irish Ancestry Research Centre (IARC),will be on hand to offer guidance and advice. The Genealogy event has added a new conference session in partnership with the U.S. National Archives and Records Administration (NARA). It’s of particular interest to anyone engaged in ‘reverse genealogy’ and trying to trace the descendants of ancestral relatives that left Ireland and settled overseas. Dorothy Dougherty, Programme director of the National Archives in New York City will be speaking about U.S. naturalisation records, Irish Famine records, and other key sources held by NARA. For more information visit them on theirFacebookOr theirWebsite. Our speaker for the month of July will be Dr. Gerard Corcoran, Irish representative for theInternational Society of Genetic Genealogy. Gerard has been involved in genetic genealogy for many years and has agreed to give two workshops on differing aspects of this fascinating subject. The workshops will take place next week (beginning 30th June). 2pm on Saturday 5th July, in the Trustee’s Room, National Library of Ireland, Kildare St.
Genetic genealogy provides a glimmer of hope for our diaspora who are unsure of where in Ireland their ancestors came from. Using genetic genealogy to break down the brick walls of traditional genealogy. Tickets will be assigned on a first come basis. Thanks, and hope to see you all there. Debbie Chapman is a Chapelizod artist, and is running a project that will be exploring the issue of dereliction in Chapelizod, and the fact that so many buildings have been left empty and derelict, even while there’s a housing crisis. Eneclann is providing historical research on who’s lived in the village of Chapelizod in the last 150 years.This is a Community Based Arts Project responding to the large number of derelict buildings in Chapelizod Village, Dublin and it’s environs. Debbie will be drawing on the real stories of past lives as the inspiration for her art.Recently, Dublin council bought a derelict site with ruined houses from the early 1700s, to redevelop. The council has put a hoarding up outside these houses, and Debbie Chapman has been asked to design and paint the hoarding. The purpose of this project is to explore the impact of decline and deterioration of historic buildings at the centre of Chapelizod’s village and through shared artistic practice create a strong sense of place within the current community. The intended outputs of the project are to create artistic interventions instilled with community consciousness and deliver a series of community arts events, which will have a positive impact on local people, affected by the decline in their immediate environment. Large wooden cut-outs with painted images from the past will be attached to the hoarding. The project will culminate in a collaborative Visual Arts Exhibition to be held in the village accompanied by a Project Book and a Public Art Installation in Sept/Oct 2014. The project, is led by artist Debbie Chapman, and is funded by Dublin City Council, Ballyfermot/Chapelizod Partnership and Eneclann. We will provide you with regular updates over the summer, to track the project’s progress which we will feature in our newsletters and also on ourwebsite blog. We now have 11 new download releases available on our website. justclick hereto have a look. Check out Fiona Fitzsimons’ column, Kindred Lines in the July/August 2014 edition ofHistory Ireland. “Irish involvement in the First World War is contentious, and historians cannot agree on either the numbers of Irish engaged in the conflict, or the number of Irish war dead. Official estimates are 210,000 mobilised and 49,300 dead, but these figures are open to challenge. Research Tip of the Week! Most researchers tracing an Irish WWI ancestor will start with the Army Service Records, the largest of all the British Services. Less than half of all service records actually survive, because of archival destruction during the London Blitz in 1940/41. From the original 6 ½ million+ service records, only 3 million now survive. There are however several other sources that can help you bridge this gap in the British Army Service records. Everyone who served overseas was entitled to the British and Victory (Campaign) medals. A lesser number of people also received awards for gallantry or distinguished service. The National Archives U.K. has over 5 million records for British Army Medal index cards 1914-1920. In addition to the traditional British Armed Services the medal cards include women’s services, the Indian Army, and some civilians. This entry was posted in Newsletters and tagged advice, archive, Brian Donovan, Chapelizod, competitions, Debbie Chapman, email, Eneclann, expert workshops, Family History, findmypast, Fiona Fitzsimons, Genealogy, Genealogy News, History Blog, History Ireland Magazine, Ireland, Irish, Irish family history, Irish genealogy, Latest Downloads, Limerick, Limerick City Events, Lorna Moloney, National Library of Ireland, news, newsletter, online, publications, research, Research experts, Research Tips, Stuart Rosenblatt, subscribe, subscription, The Genealogy Event, The Strand Hotel Limerick, UCC.